The use of laparoscopy has revolutionised the surgical field with its advantages of reduced morbidity with early recovery. Laparoscopic procedures have been traditionally performed under general anaesthesia (GA) due to the respiratory changes caused by pneumoperitoneum, which is an integral part of laparoscopy. The precise control of ventilation under controlled conditions in GA has proven it to be ideal for such procedures. However, recently the use of regional anaesthesia (RA) has emerged as an alternative choice for laparoscopy. Various reports in the literature suggest the safety of the use of spinal, epidural and combined spinal-epidural anaesthesia in laparoscopic procedures. The advantages of RA can include: Prevention of airway manipulation, an awake and spontaneously breathing patient intraoperatively, minimal nausea and vomiting, effective post-operative analgesia, and early ambulation and recovery. However, RA may be associated with a few side effects such as the requirement of a higher sensory level, more severe hypotension, shoulder discomfort due to diaphragmatic irritation, and respiratory embarrassment caused by pneumoperitoneum. Further studies may be required to establish the advantage of RA over GA for its eventual global use in different patient populations. Background: Thoracoscopic oesophageal mobilisation during a minimally invasive oesophagectomy (MIE) is most commonly performed with the patient placed in the lateral decubitus position (LDP). The prone position (PP) for thoracoscopic oesophageal mobilisation has been proposed as an alternative. Materials and Methods: This was a retrospective, comparative study designed to compare early outcomes following a minimally invasive thoracolaparoscopic oesophagectomy for oesophageal cancer in LDP and in PP. Results: During the study period, between January 2011 and February 2014, 104 patients underwent an oesophagectomy for cancer. Of these, 42 were open procedures (transhiatal and transthoracic oesophagectomy) and 62 were minimally invasive. The study group included patients who underwent thoracolaparoscopic oesophagectomy in LDP (n = 23) and in PP (n = 25). The median age of the study population was 55 (24-71) years, and there were 25 males. Twenty-one (21) patients had tumours in the middle third of the oesophagus, 24 in the lower third, and 3 arising from the gastro-oesophageal junction. The most common histology was squamous cell cancer (85.4%). The median duration of surgery was similar in the two groups; however, the estimated median intraoperative blood loss was less in the PP group [200 (50-400) mL vs 300 (100-600) mL; P = 0.01)]. In the post-operative period, 26.1% patients in the LDP group and 8% in the PP group (8%) developed respiratory complications. The incidence of other post-operative complications, including cervical oesophagogastric anastomosis, hoarseness of voice and chylothorax, was not different in the two groups. The T stage of the tumour was similar in the two groups, with the majority (37) having T3 disease. A mean of 8 lymph nodes (range 2-33) were retrieved in the LDP group, and 17.5 (range 5-41) lymph nodes were retrieved in the PP group (P = 0.0004). The number of patients with node-positive disease was also higher in the PP group (19 vs 10, P = 0.037). Conclusion: MIE in the PP is an effective alternative to LDP. The exposure obtained is excellent even without the need for a complete lung collapse, thereby obviating the need for a double-lumen endotracheal tube. A more meticulous dissection can be performed resulting in a higher lymph nodal yield. Background: Laparoscopic appendectomy (LA) is gradually gaining popularity among paediatric surgeons for complicated appendicitis. A retrospective study was conducted to compare conventional single port LA, multiport LA and open appendectomy (OA) for complicated appendicitis in children. Patients and Methods: From January 1995 from December 2014, 1,408 patients (604 girls, 804 boys) underwent surgery for uncomplicated and complicated appendicitis. The patient characteristics, operation times, duration of hospitalization, operative costs, and postoperative complications were recorded. A 10-mm 0 ° scope with a parallel eye piece and an integrated 6 mm working channel were inserted through an 11-mm "conventional umbilical port" for single port LA. Results: A total of 314 patients with complicated appendicitis (128 girls, 186 boys) underwent appendectomy. Among these, 102 patients (32.4%) underwent single port LA, 17 patients (5.4%) underwent multiport LA and 195 patients (62.1%) underwent OA. The hospital stay of the single port LA group was significantly less (3.88 ± 1.1) compared with multiport LA (5.41 ± 1.2) and OA groups (6.14 ± 1.1) (P < 0.001). Drain usage, wound infection and adhesive intestinal obstruction rates were significantly high in the OA group. There was no significant difference between the groups in postoperative intraabdominal abscess formation. Single-port LA performed for complicated appendicitis was cheaper compared with the other groups. Conclusions: The present study has shown that single-port LA for complicated appendicitis can be conducted in a reasonable operative time; it shortens the hospitalization period, markedly reduces postoperative wound infection and adhesive intestinal obstruction rates and does not increase the operative cost. Objective: To evaluate the feasibility and safety of laparoscopic surgery for treating adnexal masses during the first trimester of pregnancy. 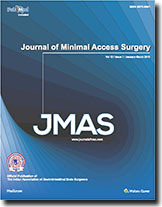 Study Design: An observational study of a prospective collection of data of all pregnant women who underwent laparoscopic surgery for adnexal masses during the first trimester of pregnancy between January 1999 and November 2012 at the Obstetrics and Gynecology Department of the Italian Hospital of Buenos Aires, Buenos Aires, Argentina was performed. Results: A total of 13 women were included. The median (range) gestational age at the moment of surgical procedure was 7 weeks (range: 5-12 weeks). The main indication of surgery was cyst torsion in four cases (30.7%) and rupture of ovarian cysts in four cases (30.7%). 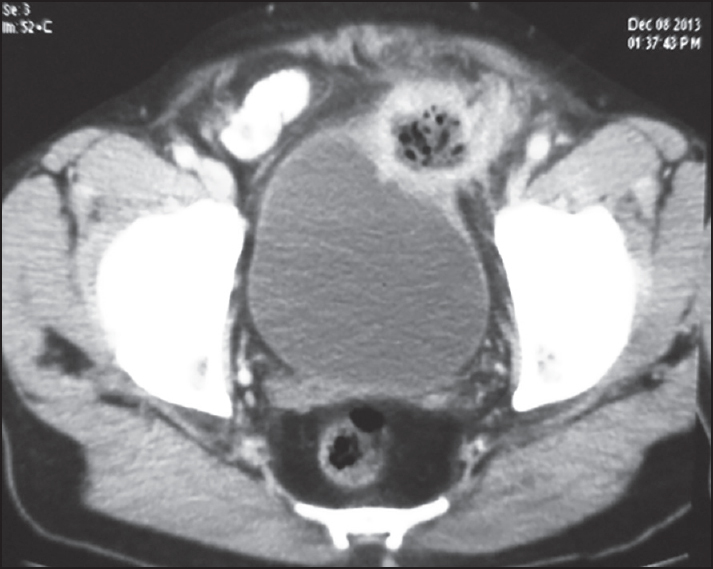 Other indications included persistent ovarian cyst in three patients (23%) and heterotopic pregnancy in two cases (15.3%). Neither surgical complications nor spontaneous abortions occurred in any of the cases and the post-operative period was uneventful in all the cases. No cases of intrauterine growth retardation, preterm delivery, congenital defects, or neonatal complications were registered. Conclusion: The treatment of complicated adnexal masses by laparoscopic surgery during the first trimester of pregnancy appears to be a safe procedure both for the mother and for the foetus. Additional research on a larger number of cases is still needed to support these conclusions. Introduction: Both converted and difficult laparoscopic cholecystectomies (LC) have impact on operating time and training of juniors. The aim of this study is to evaluate parameters that predict difficult LC or conversion (C), and find predictive values for different cut-off points of C-reactive protein (CRP) for conversion. Materials and Methods: A retrospective cohort study of cholecystectomies performed from January 2011 to December 2012 at NHS trust was undertaken. Association of intra-operative difficulties or conversion with the following factors was studied: Age, gender, CRP, white blood cell count (WBC), history of pancreatitis, and endoscopic retrograde cholangiopancreatography (ERCP). Results: Two hundred and ninety one patients were analysed (222 laparoscopic, 45 difficult LC and 24 C). Only 141 patients had a recorded CRP. Median CRP was highest for patients who were converted (286.20) compared to those who had difficult LC (67.40) or LC (7.05). Those patients who did not have preoperative CRP (8/150, 5.3%) had less chance of conversion than those who had CRP (16/141, 11.34%) (P = 0.063). Patients with CRP of ≤220 (3/91, 3.2%) had significantly less chance of conversion than those with CRP >220 (13/21, 61.9%) (P < 0.001). High preoperative CRP, WBC count and ERCP, were predictors of conversion. These factors were only marginally better than CRP alone in predicting conversion. Conclusion: CRP can be a strong predictor of conversion of LC. Further validation of the results is needed. Aim: To evaluate the laparoscopic operations performed in our department according to the modified Clavien classification system of complications. 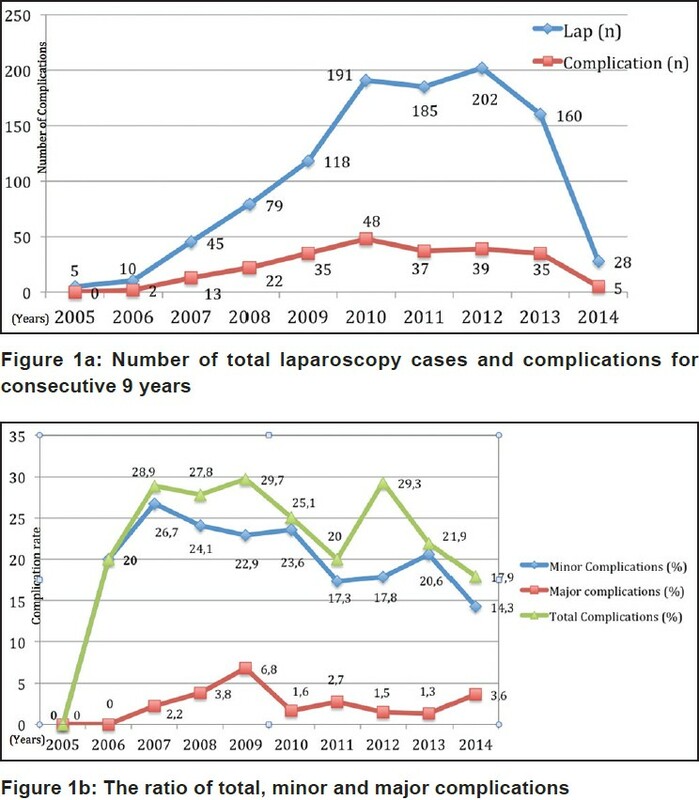 Materials and Methods: Between September, 2005 and February, 2014, a total of 1023 laparoscopic cases were performed. This period was divided into three terms (Terms 1, 2 and 3 consisting of 38, 32 and 32 months, respectively). According to the European Scoring System (ESS), easy (E), slightly difficult (SD), fairly difficult (FD), difficult (D), very difficult (VD) and extremely difficult (ED) cases were 35, 88, 170, 390, 203 and 137, respectively. The perioperative complications were evaluated based on the 3 time periods, with a specific emphasis on determining the learning curve according to the modified Clavien classification system of complications. Results: A total of 236 (23.1%) complications were observed according to the modified Clavien classification. The minor (Clavien I-II) and major (Clavien III, IV and V) complication rates were 20.5% (n = 210) and 2.4% (n = 26), respectively. Clavien I was the most frequently encountered type of complication (n = 120, %11.7). No significant difference was observed among all 3 time periods regarding total complication rates. The D cases had the highest complication rate compared to E, SD, FD, VD and ED cases among all three terms. The total number of complications increased significantly with increasing grade of technical difficulty according to the ESS. Conclusion: Complications encountered in our laparoscopic surgery experience were predominantly minor, and the rate of complications was not significantly increased during the learning curve. The present data can provide guidance and manage expectations for surgeons introducing laparoscopy into their practice. Background: Despite the drive toward centralization of surgery in high-volume centers, the majority of colectomies are still performed by low- or medium-volume surgeons. Materials and Methods: A modification of the technique of laparoscopic right colectomy (LRC) originally described by Young-Fadok and Nelson was developed. 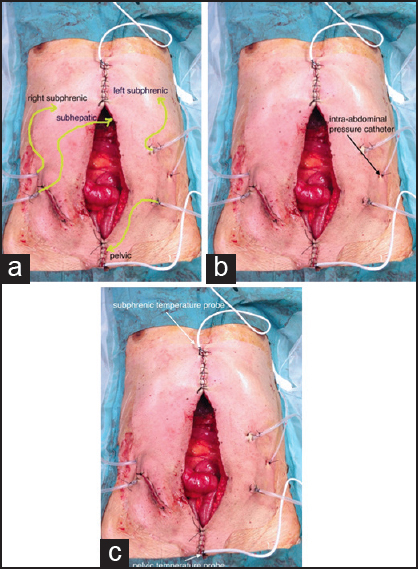 The key points of that technique were maintained, but a different port-site layout and a counterclockwise approach were adopted, to warrant better trocar triangulation, to reduce the need of right colon manipulation and to avoid dissection along false planes. This modified technique was applied in 82 patients by 16 surgeons with no previous experience in LRC. Results: Average operative time was 125 ± 35 min. Conversion occurred in 10 cases (12.2%). 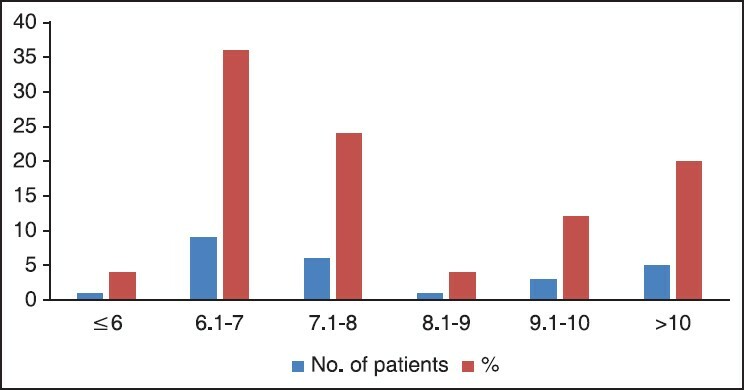 Grade III postoperative complications occurred in 3 patients (3.6%). No postoperative mortality was observed. Average number of lymph nodes retrieved was 19 ± 6. Average length of stay was 7 ± 4 days. 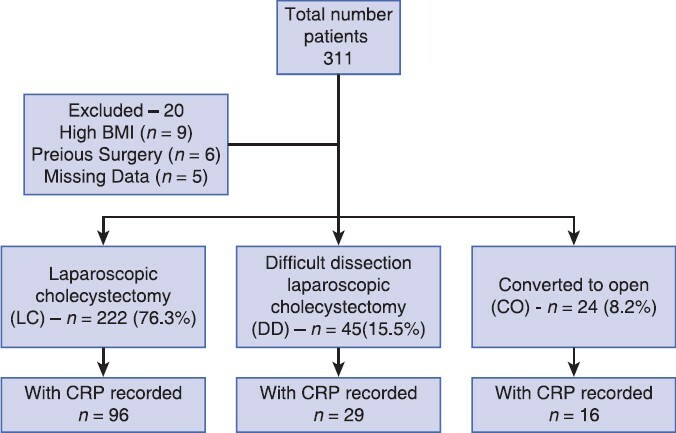 Conclusion: Providing low-volume surgeons with simplified and easy-to-learn surgical techniques could improve outcomes and lead to an increased use of laparoscopy. Aim: To evaluate the demographic and clinical parameters affecting the outcomes of ambulatory laparoscopic cholecystectomy (ALC) in terms of pain, nausea, anxiety level, and satisfaction of patients in a tertiary health center. Materials and Methods: ALC was offered to 60 patients who met the inclusion criteria. Follow-up (questioning for postoperative pain or discomfort, nausea or vomiting, overall satisfaction) was done by telephone contact on the same day at 22:00 p.m. and the first day after surgery at 8: 00 a.m. and by clinical examination one week after operation. STAI I and II data were used for proceeding to the level of anxiety of patients before and/or after the operation. Results: Sixty consecutive patients, with a mean age of 40.6 ± 8.1 years underwent ALC. Fifty-five (92%) patients could be sent to their homes on the same day but five patients could not be sent due to anxiety, pain, or social indications. Nausea was reported in four (6.7%) cases and not associated with any demographic or clinical features of patients. On the other hand, pain has been reported in 28 (46.7%) cases, and obesity and shorter duration of gallbladder disease were associated with the increased pain perception (P = 0.009 and 0.004, respectively). Preopereative anxiety level was significantly higher among patients who could not complete the ALC procedure (P = 0.018). Conclusion: Correct management of these possible adverse effects results in the increased satisfaction of patients and may encourage this more cost-effective and safe method of laparoscopic cholecystectomy. Background: Despite strict patient selection criteria, diabetes remission is not seen in all patients after gastric bypass. Can length of the common limb influence diabetes remission? Aim: To find if any correlation exists between the length of the common limb and remission of diabetes. Study Design: Prospective study. Materials and Methods: Twenty-five consecutive patients with Type II diabetes mellitus and a fasting C-peptide >1 ng/ml who underwent laparoscopic Roux-en-y gastric bypass were included. All patients had standard limb lengths and length of the common limb was measured in all patients. Patients were followed up and glycated haemoglobin (HbA1c) was repeated at 6 months postoperatively. Pre- and postoperative HbA1c were then correlated with the lengths of common limb to look for any relation. Statistical Analysis: Descriptive and inferential statistical analysis, analysis of variance (ANOVA). Results: Of the 25 patients, 15 were females and 10 were males. The mean age was 44.16 years and the mean body mass index (BMI) was 43.96 kg/m 2 . Preoperative HbA1c varied from 5.8 to 12.3%. Length of the common limb varied from 210 to 790 cm (mean 470.4 cm). HbA1c at 6 months ranged from 4.8 to 7.7% (mean 5.81%). On comparison of preoperative and 6 months postoperative HbA1c and correlating with the length of common limb, we found that patients with a common limb of length <600 cm had a statistically significant improvement in HbA1c compared to those with >600 cm length (P = 0.004). Conclusion: A shorter common limb does appear to have better chances of resolution of Type II diabetes mellitus in our study, thus paving the way for further studies. Introduction: The reported incidence of incisional hernia following orthotopic liver transplantation (OLT) varies from 4% to 23%. Postoperative wound complications are less frequent after laparoscopic repair while maintaining low recurrence rates. We present our experience in managing this complication. 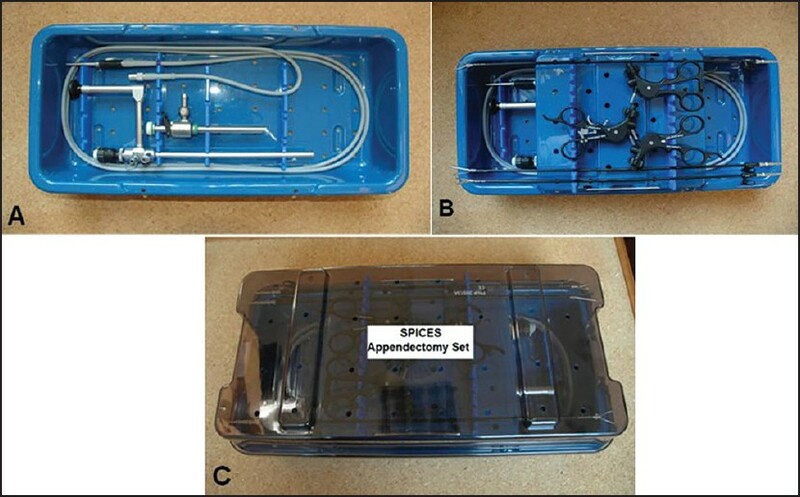 Materials and Methods: Retrospectively, collected data of all patients who underwent liver transplant and developed incisional hernias were analyzed. Patients' demographic data, anthropometric data, transplantation-related data, and repair-related operative and postoperative data were collected. Risk factors for post-transplant incisional hernia were appraised in our patients. Patients were divided into two groups: Group A included patients who had their incisional hernia repaired through the laparoscopic approach, and Group B included patients who had their incisional hernia repaired through open conventional approach. Results: A total of 488 liver transplantations were performed at our institution between May 2001 and end of December 2012. Thirty-three patients developed incisional hernias after primary direct closure of the abdominal wall with an overall incidence of 6.9%. Hernia repair was done in 25 patients. Follow-up ranged from 6.4 to 106.1 months with a mean of 48.3 ± 28.3 months. All patients were living at the end of the follow up except four patients (16%). Group A included 13 patients, and Group B included 12 patients. The size of defects and operative time did not differ significantly between both the groups. On the other hand, hospital stay was significantly shorter in laparoscopic group. 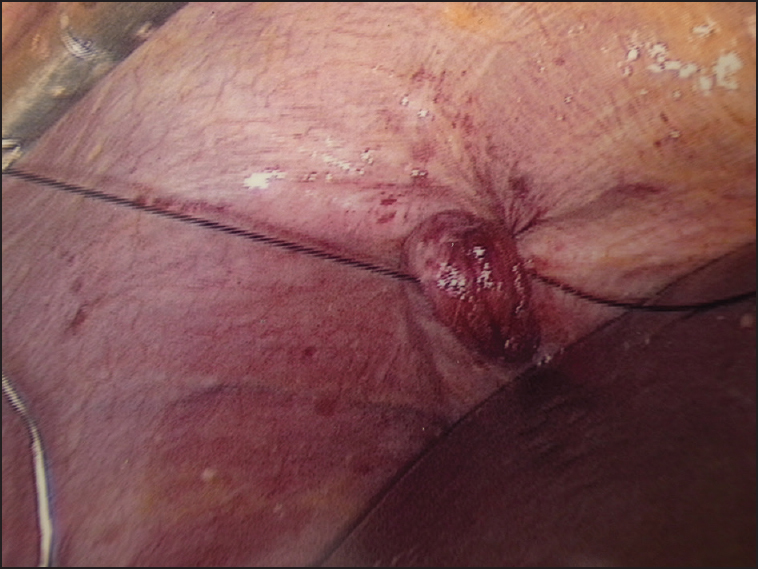 Complication rate following laparoscopic repair was insignificantly different for open repair. Conclusion: In experienced hands, laparoscopic incisional hernia repair in post-liver transplant setting proved to be a safe and feasible alternative to open approach and showed superior outcome expressed in shorter hospital stay, with low recurrence and complication rate. Background: Single-port unilateral axillary thyroidectomy has great potential to become a valid alternative technique for thyroid surgery. We tested the technique in a study on live animals and cadavers to evaluate the feasibility and reproducibility of the procedure. Materials and Methods: Institutional review board (IRB) approval was obtained in our university by the Council of Ethics for the study in surviving animals and cadavers. Subtotal thyroidectomy using unilateral axillary single port was performed in five dogs and five cadavers. Performing incision in the axillary fossa, a disposable single port was inserted. The dissection progressed for creating a subcutaneous tunnel to the subplatysmal region; after opening the platysma muscle and separation of the strap muscles, the thyroid gland was identified. After key anatomical landmarks were identified, the dissection was started at the upper pole towards the bottom, and to the isthmus. Specimens were extracted intact through the tunnel. Clinical and laboratorial observations of the experimental study in a 15-day follow-up and intraoperative data were documented. Results: All surgeries were performed in five animals which survived 15 days without postoperative complications. In the surgeries successfully performed in five cadavers, anatomical landmarks were recognised and intraoperative dissection of recurrent nerves and parathyroid glands was performed. Mean operative time was 64 min (46-85 min) in animals and 123 min (110-140 min) in cadavers, with a good cosmetic outcome since the incision was situated in the axillary fold. Conclusion: The technique of single-port axillary unilateral thyroidectomy was feasible and reproducible in the cadavers and animal survival study, suggesting the procedure as an alternative to minimally invasive surgery of the neck. Performing complex surgical procedures in patients with situs inversus totalis is a challenge because of the need to orient to the completely mirror transposed abdominal and thoracic viscera. 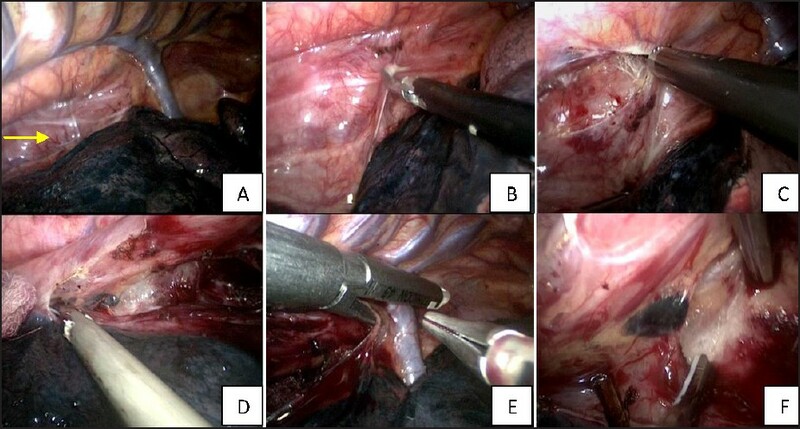 We report our experience in performing a three phase minimally invasive (thoracoscopic and laparoscopic) esophagectomy for carcinoma of the mid esophagus in a patient with situs inversus totalis. We believe that this is the first reported case of this kind. 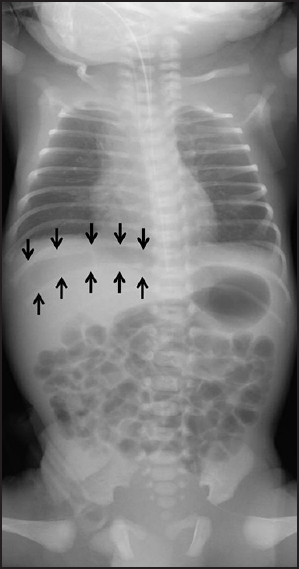 Pneumoperitoneum in a neonate is a serious condition for which bowel perforation is indicated in most cases. Because the transdiaphragmatic air dissection could occur in some ventilated neonates without peritonitis, making the right diagnosis is sometimes difficult, and exploratory laparotomy is often necessary. Here, we report the first case of neonatal pneumoperitoneum caused by a perforated Meckel's diverticulum in which diagnostic laparoscopy was useful in achieving minimal access surgery. Using a multiuse single-site port on the umbilicus could enable the extraction of a certain length of a small intestine with good cosmetic results. This method would decrease the hurdles of early surgical interventions for the suspected perforation of unknown aetiology and shorten the fasting period, which is beneficial for the neurodevelopment of small neonates. Endo-retractors are convenient devices for exposure and traction during minimally invasive surgery and are widely used in laparoscopic cholecystectomy (LC). Complications associated with the use of this device are rare. We present a patient with symptomatic gallstones who underwent LC and developed a diaphragmatic laceration as a result of the inappropriate use of an endo retractor. Although the incidence of complications with endo retractors is low, this report indicates the potential risk of diaphragmatic injury while using the retractors for exposure and traction during minimally invasive surgery. Laparoscopic splenectomy is a gold standard for management of planned benign splenic pathologies. Spontaneous rupture of the spleen (SRS) leading to acute abdomen occurs in only 1% of all splenic ruptures. Laparoscopic splenectomy in traumatic and atraumatic rupture due to intra-splenic pathology is reported. We present the first reported case of laparoscopic splenectomy in a 23-year-old male who presented with hemoperitoneum due to idiopathic or SRS. The procedure was safely accomplished with slight modified technique and minimum usage of advanced gadgets. Mesh erosion into visceral organs is a rare complication following laparoscopic mesh repair for inguinal hernia with only 15 cases reported in English literature. We report the first case of complete laparoscopic management of mesh erosion into small bowel and urinary bladder. 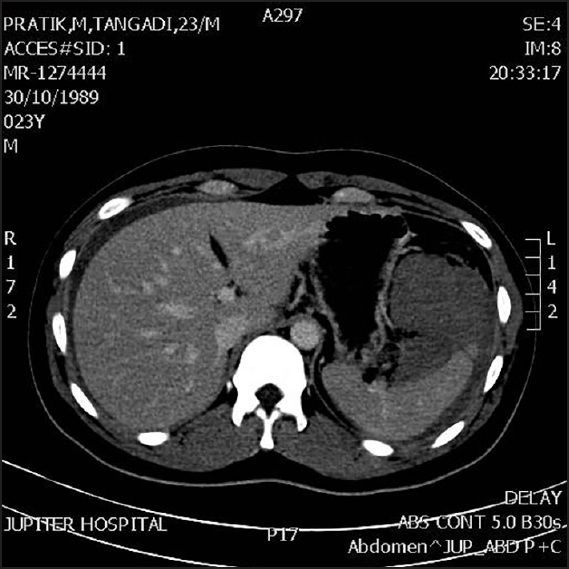 A 62-year-male underwent laparoscopic total extra-peritoneal repair of left inguinal hernia at another centre in April 2012. He presented to our centre 21 months later with persistent lower urinary tract infection (UTI). On evaluation mesh erosion into bowel and urinary bladder was suspected. At laparoscopy, a small bowel loop was adhered to the area of inflammation in the left lower abdomen. After adhesiolysis, mesh was seen to be eroding into small bowel. The entire infected mesh was pulled out from the pre-peritoneal space and urinary bladder wall using gentle traction. The involved small bowel segment was resected, and bowel continuity restored using endoscopic linear cutter. The resected bowel along with the mesh was extracted in a plastic bag. Intra-operative test for leak from urinary bladder was found to be negative. The patient recovered uneventfully and is doing well at 12 months follow-up with resolution of UTI. 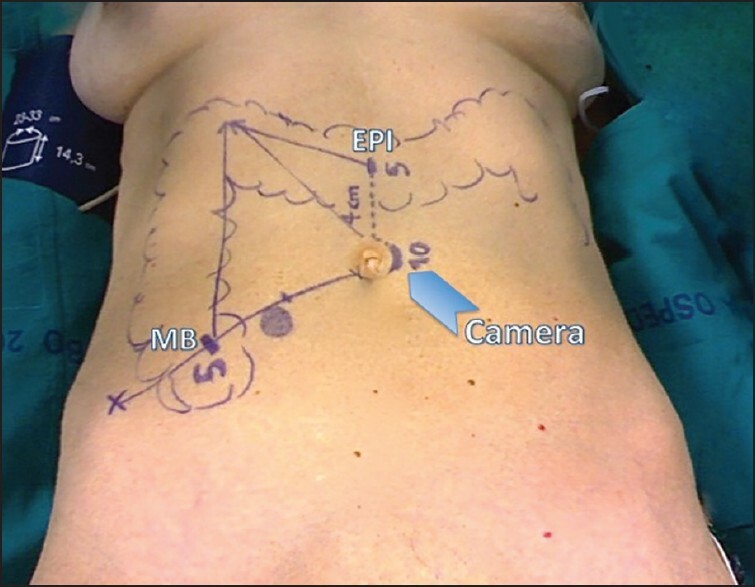 Laparoscopic approach to mesh erosion is feasible as the plane of mesh placement during laparoscopic hernia repair is closer to peritoneum than during open hernia repair. A 34-year-old man was admitted in our department with a 3 months history of epigastric pain, abdominal distension and tenderness. 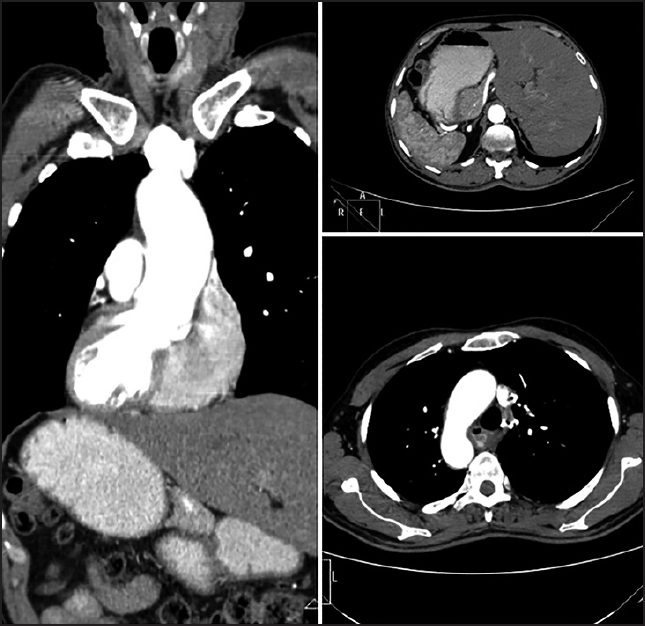 Helical computed tomography scan and magnetic resonance imaging showed a 10 cm low-density fluid-filled polilobate cystic lesion with internal septations and calcifications located between the left lobe of the liver, shorter gastric curvature, pancreas and mesocolon. Laparoscopic exploration was performed. Macroscopically the lesion was a unilocular serous cyst with a thick fibrous wall. Histopathology revealed a thin fibrous wall with a single layer of flattened to cuboidal mesothelial cell lining lacking any cellular atypia. The patient is currently alive without evidence of recurrence at 6 months. Cysts of mesothelial origin are rare lesions seen more frequently in young and middle-aged women, mostly benign and located in the mesenteries or omentum. Diagnosis is usually based on clinical examination and radiographic imaging. Immunohistochemistry is used to differentiate histologic type, with simple mesothelial cysts being positive for cytokeratins and calretinin and negative for CD31. The laparoscopic approach appears safe, feasible and less-invasive without compromising surgical principles and today should be considered the gold standard in most cases. Hyperthermic intraperitoneal chemotherapy (HIPEC) is currently delivered after cytoreductive surgery in patients with several kinds of peritoneal surface malignancies. Different methods for delivering HIPEC have been proposed all of them being variations between two modalities: the open technique and the closed technique. The open technique assures optimal distribution of heat and cytotoxic solution, with the disadvantage of heat loss and leakage of cytotoxic drugs. The closed technique prevents heat loss and drug spillage, increases drug penetration, but does not warrant homogeneous distribution of the perfusion fluid. A novel procedure that combines the advantages of the two techniques by means of laparoscopy is herein presented.